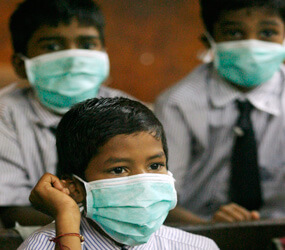 PUNE, India – The Diocese of Pune closed its schools for a week and postponed several programs as swine flu spread throughout the western Indian city. The Mumbai Archdiocese also closed its 150 high schools and five colleges for a week as a precautionary measure, reported the Asian church news agency UCA News. Public schools and cinemas in Mumbai, the capital of Maharashtra state, also were closed. By Aug. 12, when the Mumbai Archdiocese made its announcement, the H1N1 virus had claimed its sixth victim in Pune, which reported India’s first death from the disease. Elsewhere in the country, the virus has killed at least nine other people and affected hundreds. Pune, the cultural capital of Maharashtra state, was the worst-hit Indian city, and public schools also were closed. Father Louis D’Mello, secretary of the diocesan school board and principal of Vidya Bhavan Higher Secondary School, said Aug. 11 the school closures were a precautionary measure, and the diocese’s 1,900 students were instructed not to leave their homes during the week. Among Pune Catholic institutions closed was Jnana-Deepa Vidyapeeth, a pontifical institute of philosophy and religion, billed as Asia’s largest seminary, UCA News reported. The city’s first victim was a student at St. Anne’s High School, managed by the Religious of Jesus and Mary. The 14-year-old Muslim girl died Aug. 3. Sister Silvia Coelho, school principal, said that after the death government authorities tested all 2,200 students for the virus and two more girls tested positive, sparking panic in the city. Government medical teams then disinfected all the classrooms, the nun added.